If you have painted your wheels, you may be wondering which the best wheel cleaners to use are. Of course, brake dust will still stick on to a car’s wheel whether it is painted or not. Painted wheels require special care to ensure that the paint does not peel off or become discolored. For this to happen, you need to find the best tire cleaner for painted rims. Here is a review of several options you might have. Note: To find black wheel cleaners read this article before. #1Car guys have been in the industry for a long time. As such, they have had a lot of experience testing and researching what works and what does not. Their vast experience assures you that they provide you with the best cleaning products for your car tires and wheels, such as recommended 1 -galon painted wheel cleaner. Most car owners do not realize how much harm road salts have on their wheels. This effect is amplified when your wheels are painted. These salts eat away at your wheels causing corrosion and damage. If your wheels are painted, then your paint might begin to peel off in some areas. This wheel clear reduces this effect by removing all these salts. With frequent use, you can do away with the corrosive effects altogether. This wheel cleaner is non-acid based. As a result, you wheels are protected from damage. Acid based cleaners do not have a PH that is conducive for wheel coats of paint. With this wheel cleaner, you can clean any wheel whether aluminum, painted or anodized. You are certain that you are offering the best for your wheels. This remedy is an Amazon bestseller! It can be suitable for cleaning polished aluminum wheels and is reviewed here. With the strong urge to go green and take better care of the planet, you need to ensure that all the products you use are environmentally friendly. Because of their experience and the fact that they already have a huge customer base, car guys have no option but to give you the best products. As such, this USA made wheel cleaner is safe for use. It is made using the best chemicals and products to ensure that you are satisfied with the results you will get. Might need to be sprayed several times on extremely caked brake dust. For this purpose another cleaner might be needed . Read this review. #2If your wheels are painted, or plasti dipped, too much scrubbing may damage your wheels. What you need is a wheel cleaner that allows you to scrub less but still have clean wheels. 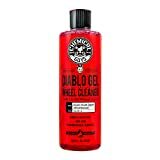 Chemical guys CLD-997 Diablo gel cleaner uses concentration suspension technology to ensure that your wheels are clean. This technology works by removing dust, contaminants, and dirt away from the wheels. This way only light scrubbing will be required. This cleaner has a neutral PH. You can, therefore, use it on any wheels whether painted or not. Its neutral PH gives you the assurance that your wheels are well taken care of. It also ensures that the chemicals on the cleaner will not react with any other chemicals that your wheels might come into contact with on the road. Your wheels will last longer and look great. The slippery gelatin rinses off easily ensuring your wheels are spot free after cleaning. If you are looking for an uncomplicated method of cleaning your painted wheels, this is what you need. This wheel cleaner is safe for painted wheels and is also easy to use. Once you spray it on to the wheel, wait for a few minutes. The suspension technology will encapsulate the dirt. It will then begin sliding through the gelatin. A light scrub will leave your wheels sparkling clean. No cleaning formula is needed. #3If your wheels have stains that seem like they won’t come out, this is the cleaner you need. With just an acid-free formula of triNova spray, you can restore the brand new look to your painted wheels. It penetrates deep into stains and removes all the dirt and stains. While this cleaner is tough on stains, it is not harsh on painted or alloy wheels. It helps coat the paint with a protective layer that ensures that your paint will last for a long time. The fact that it is tough on stains means that you will not have to scrub too much to clean your rims. As a result, you will not damage or scratch the paint. Its non-acidic nature makes it perfect since no chemical reactions will occur between the paint and the cleaner. You will not have to worry about any long term damage to your wheels. 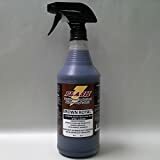 #4Flash Brown Royal wheel cleaner is safe for painted aluminum and anodized wheels. Its neutral ph assures you that your wheels will be clean and your paint protected. In fact, you can also use this cleaner for your tires. It smells great, so you will not have to rush to clean your hands after using it. This cleaner is biodegradable. If you are looking for a cleaner that is environmentally friendly, this is what you need. Its ability to clean and still protect the environment makes it one of a kind. This wheel cleaner is as very concentrated. It assures you that your wheels are clean. Its concentration makes it tough on stains. You will therefore not have to scrub too hard to get the dirt off your wheels. Tires are some of the most expensive parts of your car. Taking good care of them could as well mean you are taking care of your investment. Choosing the best wheel cleaner for your painted wheels could be the missing link between good looking and lasting investment or not being so fortunate.